Your letter3 about the supply of "Antonia"4 in Chicago5 is a distinct shock. The three people who wrote to me before Christmas were not "investigators", but bone fide buyers who wanted the book, were unable to get it, and two of them sent me checks, begging me to send a copy if I had one. I am convinced that they had made an honest effort to get the book at home before they took that trouble. It must be, as you say, that they applied to a green salesman, or to several green salesmen. Could the fact that the buyers called my name rightly, and that clerks in bookstores usually call it "Kay-thur" have anything to do with it. It is all nonsense that an unusual name is an advantage in authorship. One had much better b be named Jones. Salesmen in New York2 and Chicago always correct me when I pronounce my own name. Mr. Sell6 published a paragraph7 telling people that the name rhymed with 'rather', but if it convinced others, it did not convince the bookstores. I will read8 Miss Singmaster9's book10 as soon as I have time, be but I'm not very hopeful. Like everybody who has ever done editorial work on a magazine, I've read scores of her manuscripts. Sometimes they served a useful purpose and we bought them,; but there was no more surprise in them than in Kirkman's laundry soap. Even her faults were not interesting. She not only hadn't a voice, she seemingly had no ear; she droned along. However, I'll read her book, since you've been kind enough to send it. 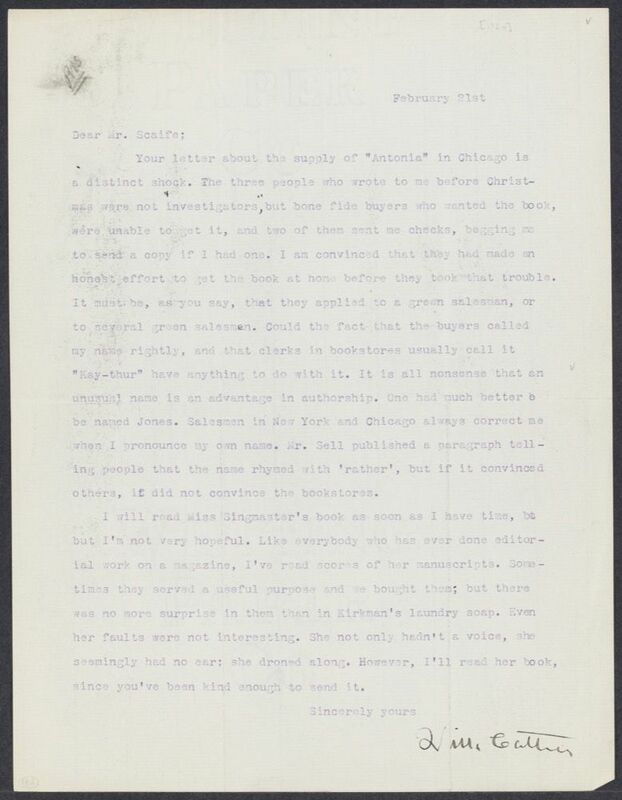 On 19 February 1920 Scaife wrote that he had sent a query to their representative in Chicago, who reported copies in stock and orders placed by McClurg and Marshall Field's. He also repeated an anecdote about a Chicago author who had similarly complained several years before that her book was unavailable at McClurg's, but their investigation proved this to be untrue, leading them to conclude that she had asked a new salesperson who did not know the title. Scaife does not imply that Cather had sent an investigator. There is no extant letter documenting that Cather was sent a copy of Singmaster's novel, but this letter suggests that Scaife had sent a copy of this Houghton Mifflin novel to her, asking her what she thought of it. Sell, Henry Blackman (1889-1974). American journalist, editor, and advertising executive. Born in Whitewater, WI, Henry Sell established himself as a journalist in Chicago in the teens, working as literary editor of the Chicago Daily News. In 1920 he left Chicago for New York City to become editor in chief of Harper’s Bazaar. After several years he left the magazine to work in advertising and became interested in developing packaged foods. During the rest of his long career, he moved back and forth between magazine publishing and food development.